town of Sighet in Transylvania. worked as a journalist and writer. balance in Paris and Israel. .it the home of Mrs.
a prophet look at Jeremiah. issue of higher pay for teachers. his efforts to restrain inflation. may postpone his trip to the U.S.
first meeting in some time. that first entered each camp. through the Department of State. recognized at the fall conference. Men's Club of Temple Beth Am. Men's Club and the Chora leers. to North Planfield, New Jersey. officially open on Jan. 10. | OSend me your informational booklet on pre-need planning. Kirschenbaum Bros., Inc., in New tbrk. Piter Memorial Chapelt, in Chicago. et on Tuesday evening, Jan.
^ing list. The Day School. school for the Fall of 1981." together all segments of the . He went on to say. "Mr.
jinor" aano w p n ami a w>i cams' tqp iar Or U "
to- hamao* lnfW, q.v. nc it afau . *T -w> Jat a.
laeua. j: ; e "
" IMM *^ aestenec u aasr. Ijll be held on Tuesday. berg Tell will be the narrator. Feb. 25 at the Ramada Inn. Valid or Act of Agression." Dr.
man of the history department. Hadassah members on .Ian 29. Blanche Perrotta, or Ruth Siegel. under the direction of Joe Turoff. are in charge of both functions. at First Federal of Delray Bank. Westgale, 12:30 p.m. on Jan. 12. 45th Street in West Palm Beach. received his Masters and Ph.D.
men of this gala event. Doroshkin will be the chairman. from New York to do the concert. | money back from Kraft. who murdered innocent peopie on Simhat-Torah. in Pans, attacked us all. Whenmarly a hundred books hive been published in a dozen languages adhng"
Then fey nwa rf,er ZcZfl^ tot "" ^ ""M object. JWups the lallers mmk v^ tawfa^^T* "* ** "*""
232A Royal PaU. Way 2? our pledges. This graph shows how paying a pledge late can severely reduce its purchasing pouer. at Palm Heach Junior College. 51 p.m.. Jan. 21 thru Feb. 18 I'. good flavor of -------- ekiff after cup after cup. The Jewish Floridian of Palm. l. to noon, begins Jan.
lions Inn. 12 and 19.
rants will be held once a month. Wednesday. Jan. 14, at 1 p.m.
For further information, call th. it will be held on Thursday. Jan.
vou with his tricks of magic. has been a In* part of Ihr holiday* for 24 years. until all pieces are coaled. Heat in oven 1 hour. Party Mix may be froxrn. somakradoublr batch. only the stag*, but the aiideance." no. vm wm-. aa a a. aa. mm arr. i iw. will be aade through the Children's Department. circuastances, giving a full refund. (LAKE WORTH & JOG RD. 3HJ..U3An8 U3HDIH 3H1 U3A09 U3HOIH 3H1 Hqino" .,... . It person in his life. Ruth, you are a fortunate lady. kf B hare I iff Manor / Ossining Community in New York. lip Mission to Israel and Egypt. Have a great time. rid Mitch we will look for you on TV. i the 1981 Edition of The World Who's Who of Women. to collect your principle plus interest. |oi inveetmenta m & withdrawal at any am*. 90 MILES FROM WASHINGTON. D.C.
treatment for their ailing child. year is inevitable and desireable. eats away the soul's peace! are to reach our destination. becoming Bar Mitzvah in a Nazi Concentration Camp). talks about Vice President-elect George Bush. on which you stand, is holy..."
Koom from 10:30 to 11:30 a.m.
sponsor an Art Auction Sunday. rnday, Jan. 16, at 8:30p.m. one is urged to attend. Monday. Jan. 19, at 12:30 pjrt. Altz Chalm Congregation Canturv Villa*. Rabbi Irving B. Cohen Joel L Levlne, Associate Rabbi ! services. Friday 8:15 p.m. Saturday Torah Seminars 10:30 a.m.
at St. Paul's Episcopal Church, 188 S. Swlnton Aw. Sabbath services. Friday at 8:16 p.m.
p.m. followed by Oneg Shabbat. Saturday 8:30 am and 6 pm "
Emanuel Eisenberg Cantor Jacob Elman Services Mondays "! Sabbath services, Friday at 8 p.m., Saturday 10 a.m.
Sabbath services, Frioay at 8:30 p.m.
at Faith United Presbyterian Church, 275 Alemeida Oms. " Rabbi Bernard Silver Cantor Benjamin Adler Sabbath""
Friday at 8 p.m., Saturday at 9 a.m. Dairy Mlnyans at 845 an"
190 North County Road. Palm Baach 33480 Phone. "obi Joel Chazln Cantor David Dardaeht l Sabbat"
lcea, Friday night at 7:30 p.m.
lews of Israel must be reinforced. Torch Run, which opened the Women's Plea for Soviet Jewry. Office Hr. Mon.. Tu.. Wd.. Fri. Thur. h Sat. events planned for (iolden Lakes. January 10th and 11th from 10 a.m. to 10 p.m. 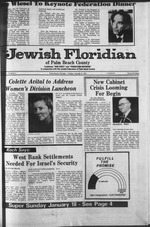 Mid Palm board 1 p.m.
Henrietta Szold board 1 p.m.
Men's Club board 7 30 p m.
$7,500 Cocktail Party 3 p.m.
We need your kosher recipes! We fly the most nonstops to Boston. The most flight -times to New York. The only thru-jet to Montreal. To Boston Nonstops at 9:15am and 1:00pm. Coachl. Four other flight-times, too. with arrivals at all three Metro Airports. 1 00pm. Plus other daily flight-times at 9:15am. 4:40pm and a thrifty Night Coach. nonstop is a Wide-Rid* Lockheed L-1011 TriStar.